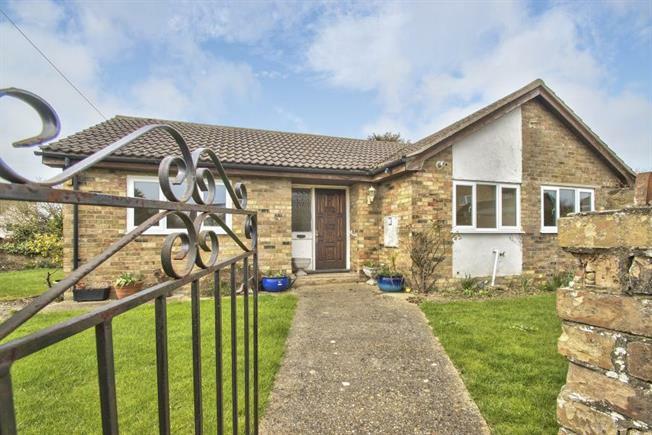 2 Bedroom Detached Bungalow For Sale in Huntingdon for Guide Price £269,950. A rarely available two bedroom detached bungalow, in need of modernisation. Internal accommodation comprises; entrance hall, lounge/diner, bathroom, two double bedrooms and kitchen. Outside the property boasts a mature wrap around garden with off road parking. Front door, opening onto the front garden. Frosted glass window facing the front. Radiator. Loft access via hatch. Double aspect windows facing the front and rear. Radiator. Frosted glass window facing the rear. Radiator, part tiled walls. Low level WC, panelled bath, shower over bath, pedestal sink. Radiator. Window facing the rear. Window facing the front. Tiled splash backs. Roll top work surface, wall and base units, stainless steel sink, space for freestanding electric cooker, space for dishwasher, washing machine and fridge/freezer. Wall mounted boiler. Wrap around garden, enclosed by timber panel fencing and brick wall with mature flower and shrub borders. Timber shed. Driveway laid to shingle.